Peninsula Streams and Friends of Swan Creek Watershed. Picture above, is from the bus stop at the corner of Ravine Way and Vernon Ave. The pine tree is in danger of being overwhelmed by the ivy. in our area that needs restoration work. To increase the tree canopy in Saanich many fast growing trees, already eight feet tall, are commonly planted. These provide an instant tree, and many are drought-resistant species. Because of its tap root, the Garry oak is an even safer bet for long term reforestation. 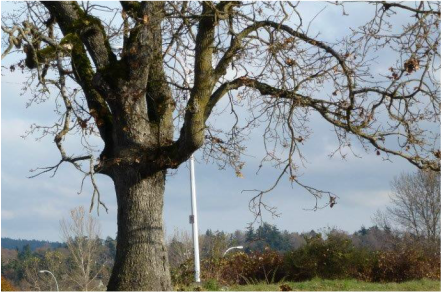 However, because of its tap root, a Garry oak must be planted when it is very young and also, it will not be recognizable as a tree, for many years. One of the Garry oaks in my yard is at least ten years old and it is only about four feet high. We are loosing our Garry oak canopy do to the loss of meadow lands. 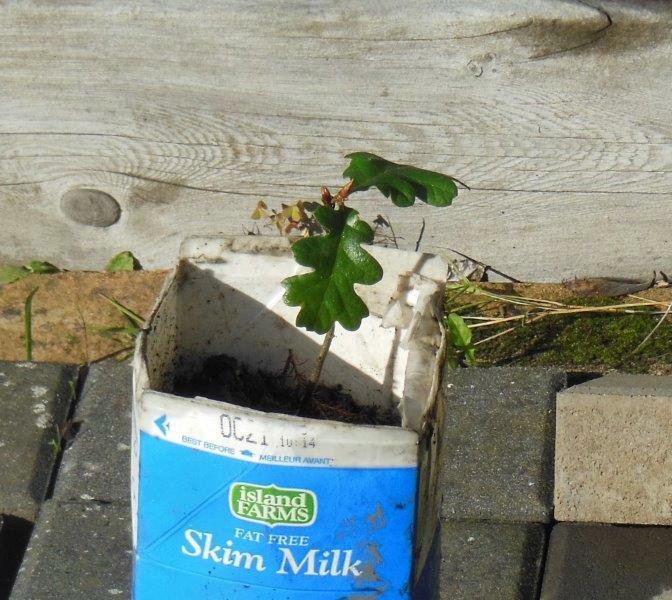 Our well-watered gardens create an advantage for the fast growing plants and few gardeners would say they like the look of a young Garry oak tree. In ten or twenty years the greater Victoria area may need them, we can only guess which imported trees will survive and which will need so much watering that they can not be maintained. Nurturing a baby Garry oak is something to be proud of, it is a gift to a future generation. It is a simple action that any landowner can take, yet it can only be done one tree at a time. It is easy to set aside one spot on your property for one tree. The tree will need to be protected by a wire fence until it is established. If you would like to be given a one/two year old tree, please contact MVCCA.